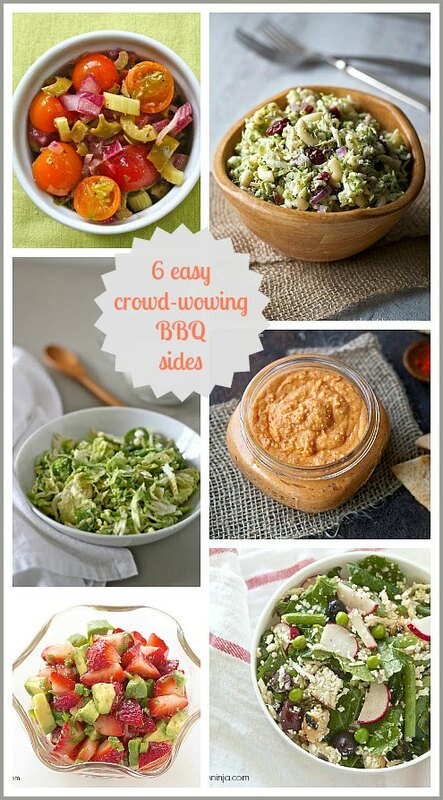 Wow the crowd at your next BBQ or cookout with these easy and delicious sides: choose from salads, appetizers and salsas. With Independence Day just around the corner, I've been fixated lately on the summer BBQ. Or cookout. Is this a regional thing? Growing up in New England, we called them cookouts. I had to learn to refer to them as "barbecues" when I moved down south. Whatever the nomenclature, I love those parties held outside that involve grilled meat. But, more than the meaty main course, I'm all about the sides: salads, dips, appetizers, chips. Those little unsung heroes are often what makes the meal. And while anyone can bring some ice cream or cookies or a flag cake made with berries and Cool Whip, I highly prefer the guest who brings an amazing side. So here's a roundup of some of my favorite BBQ (or cookout) side dish recipes, all of which are easy to make, easy to transport and guaranteed to wow the crowd. Pimento Cheese Hummus: This one is highly addictive, so watch out! A summer BBQ just isn't a BBQ without _____________ . The Ninj wants to know. without....my Avocado Sweet Lime Black Bean Dip. How's that for arrogance. I've lived north and I've lived south. Yup, cookouts and BBQ's. Cookouts are better. JUST KIDDING! Your Bloody Mary Tomato Salad looks awesome! I still have to work hard to not call them "cookouts", so I agree, Allie! Give the Bloody Mary Tomato Salad a try -- it's seriously awesome with fresh summer tomatoes. The thought of that iced tea is making me thirsty!! We spend all our weekends at the lake during the summer, and rarely without friends, so it's non-stop BBQ for us. I'm all about the sides and love any kind of veggie salad. Or bean salad. Or potato salad. Or fruit salad. Or pasta salad. You get the point. I also always like to have watermelon, everyone likes that. I"ve been putting out a plate of 3 kinds of nuts in stripes. it's remarkably successful and couldn't be easier. Add chips-and-salsa/dip/whathaveyou +fruit or veggies a bit later, and pretty soon the group doesn't mind that the grill is only so big, and the crowd is SO big. SImple genius, Cricket! It's fun to have big crowds.